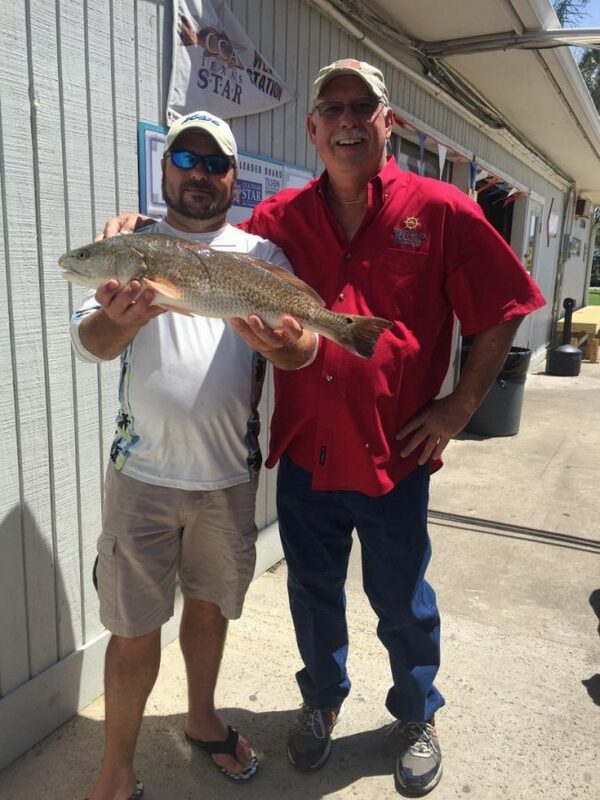 CONGRATULATIONS TO OUR SECOND TAGGED REDFISH WINNER! Fortunately for Michael Gibbs, he was registered and is now the second lucky winner of a 2015 loaded Ford F-150 “Texas Edition” XLT SuperCab, pulling a brand new 23’ Haynie Big Foot boat rigged with a Mercury 150L Pro XS OptiMax motor and Coastline trailer prize package, which will be awarded to him at the STAR Awards Ceremony in October. So far four tagged redfish have been caught, but only two are confirmed as winners at this time. That means there are fifty-six tagged redfish still out there swimming and three truck/boat prize packages still available to win! Trophy-sized prizes can be claimed by STAR anglers who bring in the first 10 tagged redfish. The first five winners will drive home in a 2015 Ford F-150 “Texas Edition” XLT SuperCab, 23’ Haynie Big Foot boat rigged with a Mercury 150L Pro XSOpti Max motor and Coastline trailer The next five tagged redfish winners will each claim a 23’ Haynie Big Foot boat with a Mercury 150L Pro XS OptiMax motor and Coastline trailers. For young anglers not of legal driving age who reel in the famous tagged red, he or she will receive the boat package plus a $20,000 college scholarship, in lieu of the truck. Last year thirteen tagged redfish were caught, but only four anglers claimed prizes. The others, unfortunately, were not registered for the CCA Texas STAR. Other fish can net big rewards in the tournament. STAR contestants who catch the largest speckled trout in the north, central and southern regions of the Texas Coast will each take home the Shoalwater 21′ Cat, powered with a Mercury 150L Pro XS OptiMax and McClain trailer. STAR blue water anglers who land the heaviest kingfish, dorado and ling (cobia) in the Offshore Division will each win the awesome Polaris Ranger Crew 570 EPS UVs in Polaris Pursuit Camo each with a Big Tex 35sa Trailer. In the Inshore Division the Blue Wave’s 180 SV Southern Skiff boat, Mercury 115 OptiMax motor and McClain trailer will also be given to the anglers for netting the biggest flounder, gafftop and sheepshead. In hopes of luring more youth to the sport of fishing, the STAR Scholarship Divisions offer a total of ten college scholarships in $20,000 and $50,000 increments. STAR participants, ages 6-10, who catch the largest flounder, sheepshead or gafftop will each be awarded a $50,000 college scholarship. Participants, 11-17 years of age, who catch the largest flounder, sheepshead or gafftop, as well as, the largest speckled trout in each of the three Texas Coast regions (north, central and south) will each be awarded a $20,000 college scholarship. In addition to these nine scholarship offerings participants, ages 6-17 years old in 2015, are eligible for a bonus drawing that will net one lucky youth a $20,000 college scholarship even if the participant never wets a line or enters a single fish during the entire tournament! As a reminder, anglers under 18 years are eligible to win the scholarships and all other prizes (truck/boat packages and boat packages) offered by CCA Texas STAR tournament. Major sponsors for the 26th Annual CCA Texas STAR Tournament include Texas Ford Dealers, Tilson Home Corporation, Capital Farm Credit, , Academy Sports + Outdoors, Whataburger, Ozarka, Rio Ammunition, Hoffpauir Polaris, Mercury Marine, KTRK-abc13, Houston Community Newspapers, Fox Sports Southwest, Haynie Boats, Shoalwater Boats, Dargel Boats, Blue Wave Boats, Texas Fish & Game Magazine, Texas Oilman’s Charity Fishing Tournament, Coastline Trailers, McClain Trailers, Chris’s Marine and Mt. Houston Marine. The CCA State of Texas Angler’s Rodeo (CCA Texas STAR) Tournament is the annual membership recruitment drive for CCA Texas, a nonprofit organization of sportfishing enthusiasts and conservationist working to save the natural resources of Texas coastal waters. This year’s event began at sunrise on Saturday, May 23 and will end on Labor Day, September 7 at 5p.m. CCA Texas’ Web page can be found at http://www.ccatexas.org.